This being the first club in 2019 John welcomed everyone and wished them a Happy New Year. He mentioned that Eric Warnecke was convalescing at home after leaving hospital. (Eric was a founder member and our first Chairman back in 1992) also to see Ken White back with us. There were a few more notices and then John mentioned who the tutors were this morning and to let the shavings fly. 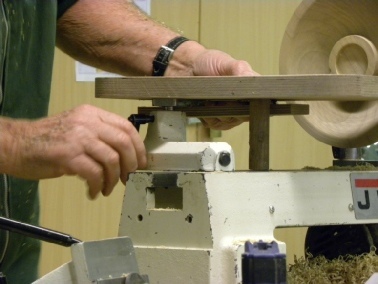 First up was Bill Thorne who was going to turn fruit but with a twist which was: - preparing the timber at home he cut the timber in a certain way and re-glued it with a thin dividing piece of wood of a different type to the main block. 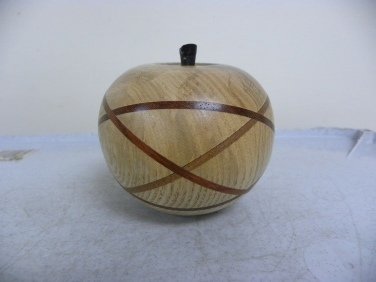 This he did many times so that he finished up turning an Apple with a Celtic Knot pattern. Bill also did other styles of fruit with texturing or with just a plain finish. Going round the floor Mike Haselden came next whose opening comment was “I am turning a LOG” explaining to those who stood around that he was going to hollow out and make a thin walled vessel with some members having hands on. 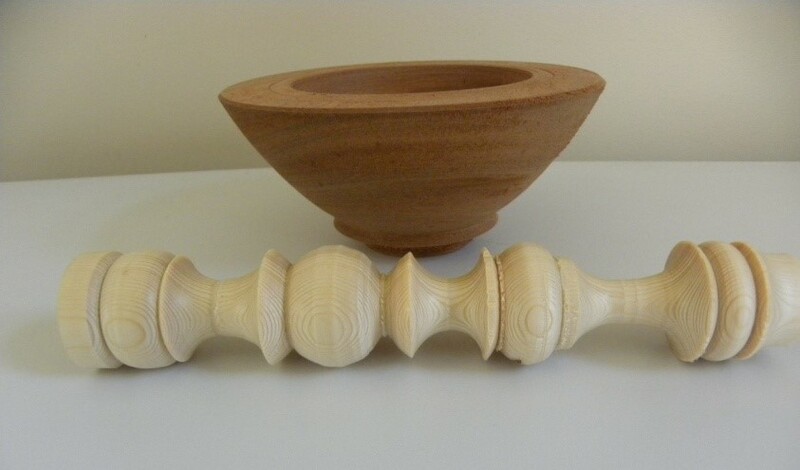 Next was Alan Brown who had two projects to show the first was hollowing out techniques for making Hollow Forms. 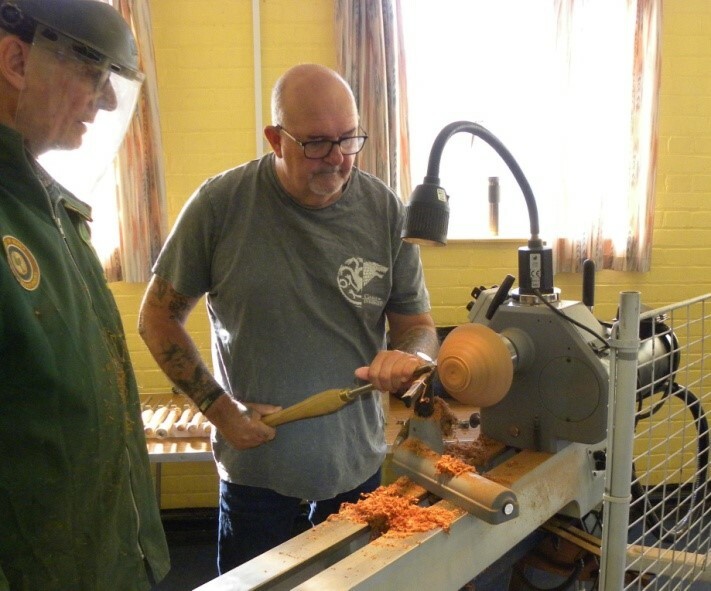 Half way through the morning he changed to making a Goblet type vessel to take an Arrow which was watched by many members. 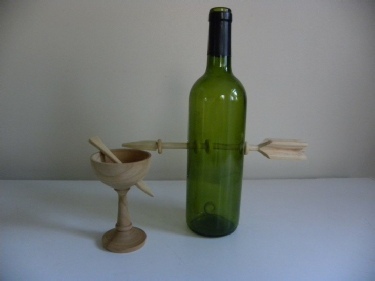 Photos show the variations of what can be achieved and if you look closely at the bottle you will see 5 captive rings 4 on the Arrow and 1 at the bottom of the bottle. Don was set up to o Pens but only had one member wanted to ask questions on trying to overcome certain problems on pens which he had made. Hopefully together we resolved the problems. 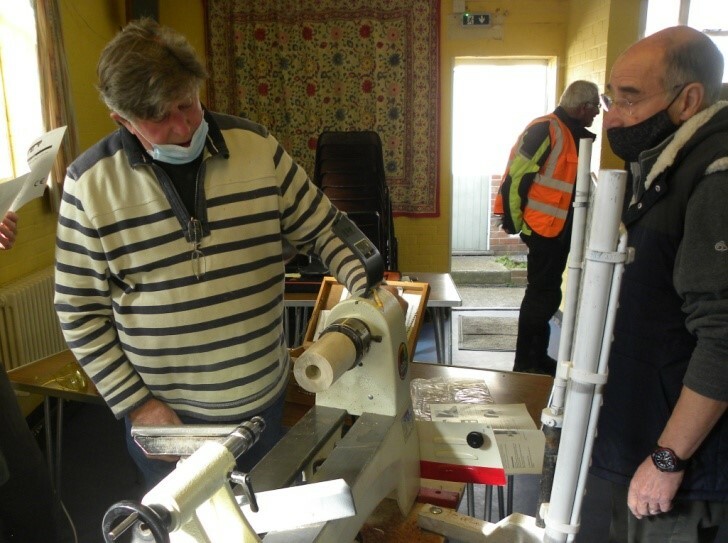 Again there was a lot of interest in sharpening tools and with John at the helm members were able to can some good pointers on this subject. If any member has a problem with any aspect of turning you are welcome to come along and discuss it with any of the tutors who will give advice and help, the next Saturday Club will be 9th February 2019 at 8.45. 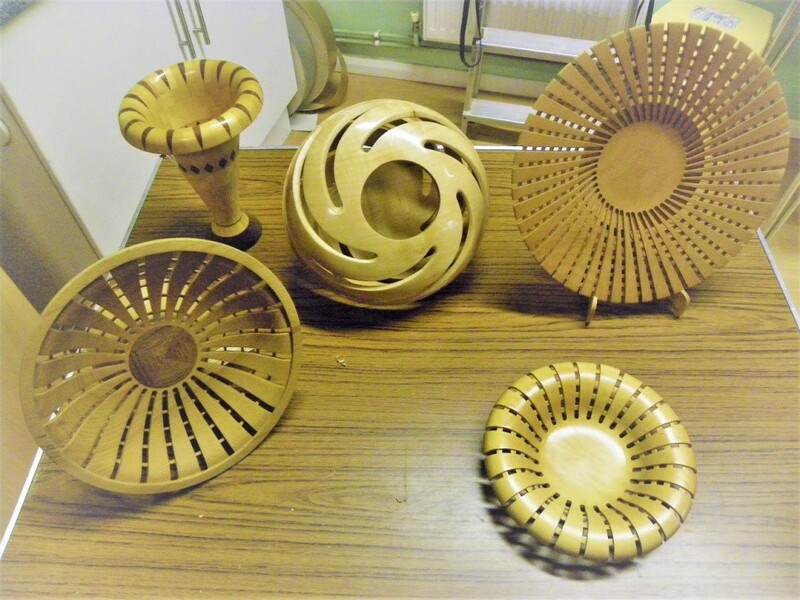 The above photo shows a few examples of Johns work and how he achieved the designs which he will be demonstrated this evening. The evening started with John explaining that the notices would be at the refreshment break when Ken Briffitt would give a short discussion on this year’s competition called Stellar. More information can be found on the web-site under Programmes – Kens Challenge. John started his demo by telling us that he had already prepared the blank by turning two chucking points to each side of the piece also rough turned the inside to save time. 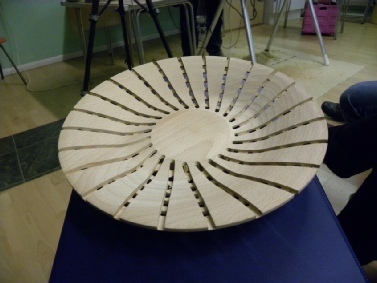 The piece was then reversed and the underside was turned and a small square of Plywood with one side having double sided tape attached, this was then placed in the middle of the chucking point. (Explain more on this later). 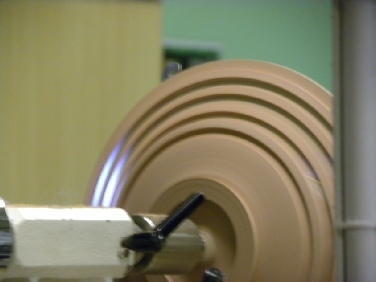 Inside of bowl showing the Chucking point. 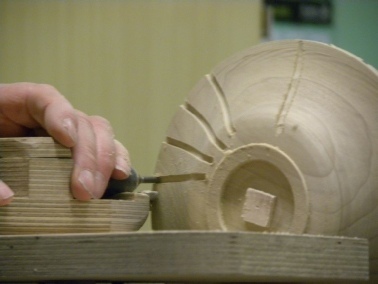 Once the desired shape was achieved it would normally be sanded and finished. The piece was then reversed and was then worked on to bring the wall thickness down to approximately 6mm. 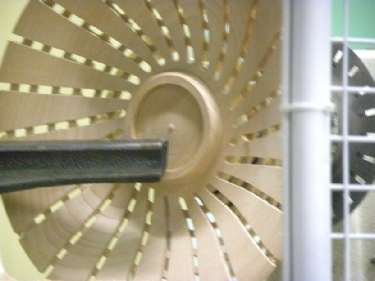 John then brought the Tailstock up with a centre point inserted so that he could make an indent in the Plywood for later use. 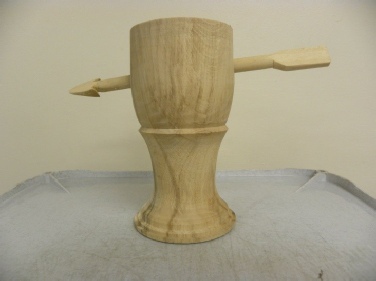 The next process was going to need a platform which had been designed to fit his lathe it had a pillar which was the diameter of the hole in his Banjo, also attached was a wooden dowel the height being set so that when his Dremel Sledge was placed on the platform it rested on the bed of the lathe. This was so that each time it was presented to the work piece it was always at the correct height. John continued to explain that the Platform with the Sledge placed on the top the cutter would be just above centre. 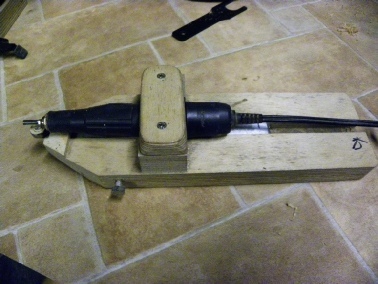 Dremel showing cutter and depth gauge. Sledge and Platform showing the first routed slots. He then proceeded to rout out the indentations to a depth of 3mm taking small cuts at a time with not much pressure, the centre chucking point was his reference to how far into the bowl he went. The Blue Peter mode then came into play as he had one completed on the inside so the two pieces switched places. The time had come to cut the recesses to make the Ribs around the outside of the bowl. On to the rest he added a strip of Masking Tape and drew some pencil lines on it to represent the position of his cuts. Taking a small Parting Tool proceeded to cut the Ribs out going in until they met the Spines on the other side. To make this easier a light was placed on the front so that the light would filter through. 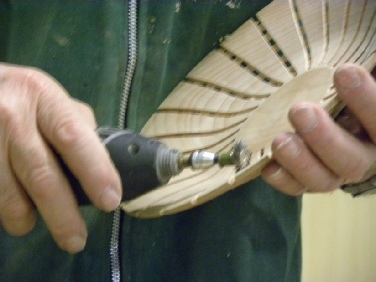 The next thing to do was to reduce the Ribs down to the same thickness as the Spines so to do this John removed the wood carefully and with not too much pressure until the required thickness was met. 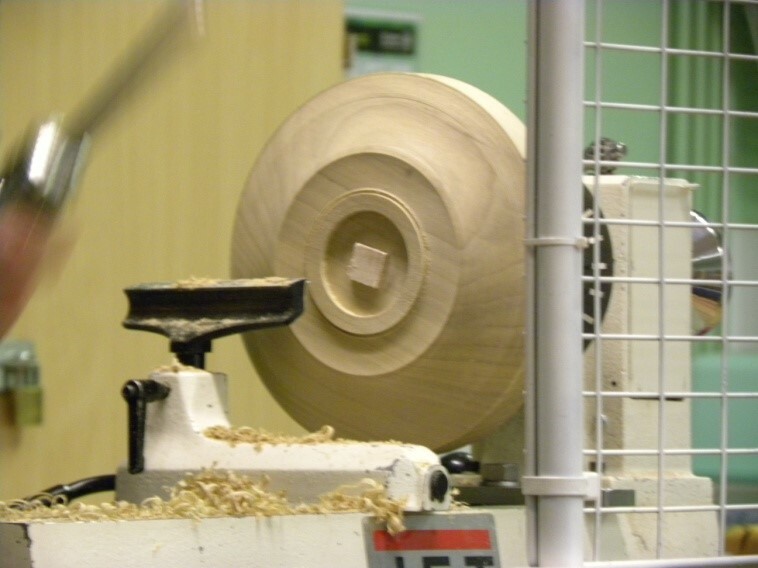 This wasn’t started until at least four rings had been cut then when they were all to the right thickness then each one he turned from then was reduced accordingly. When the underside was finished it was reversed and the photo shows you the inside of the bowl with the Ribs showing through it also shows the Indexing ring which was used to make the first cuts on the inside of the bowl. 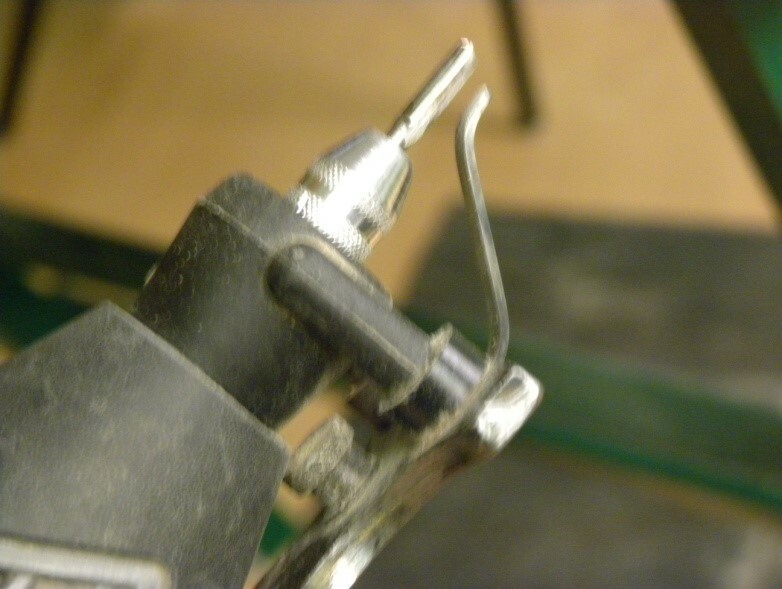 John stated that now was the time to finish the inside by removing the chucking point. Once achieved it was time to reverse the piece to remove the back chucking point. John made a Wooden Face plate by firstly attaching a Faceplate Ring to one side then attached it to the lathe turned it to a true round before applying a piece of untreated Cork Tile to the face. 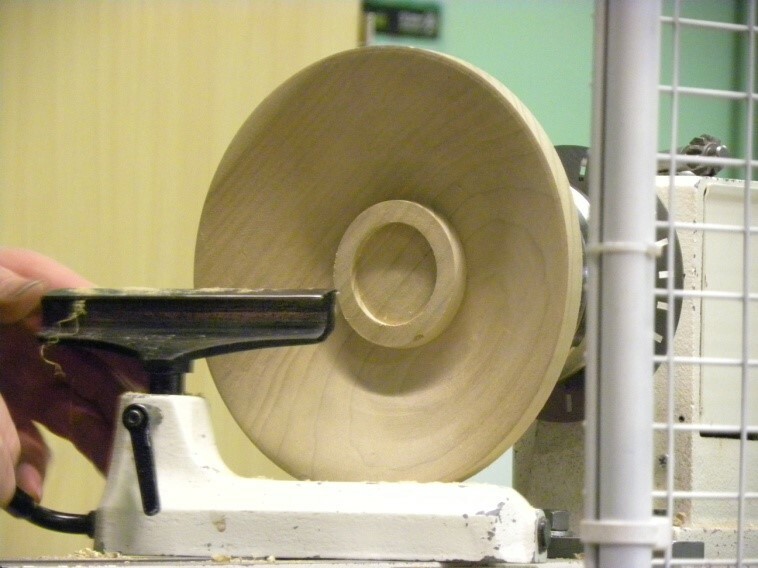 This disc was fitted on to the lathe and placing the face of the bowl against the Cork Tile and bringing up the tail stock with a Ring Centre fitted he found the centre of the small piece of Plywood that had been attached right at the beginning. It was now time to remove the final chucking point and to finish the underside of the bowl once this was done it was time to clean up the routed slots which made the Ribs and Spines. Taking a Dremel and fixing a Wire Brush to it John showed how to clean up the grooves between the Ribs & Spines. You could also use a small steel ruler with a piece of Abrasive paper wrapped round it and carefully clean them up as well. Then when completely satisfied he finished piece would be given at least three coats of Finishing Oil by applying with a brush, remove all excess allow to dry for a day before doing the same procedure again. This can be done as many times as you wish but three would generally be enough. It was now 21.30hrs and John said that he had just thought of something which was what would a piece look like with the Spines going the same way on both the outside and inside of the bowl. 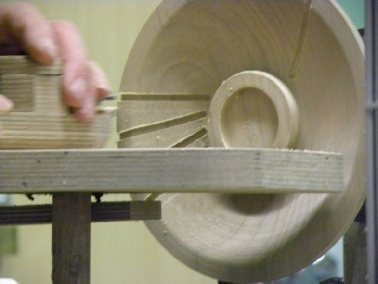 So reverting back to his original piece he remounted it on the lathe and proceeded to demonstrate how this might work. Using a Dremel and a Small Wire Brush for cleaning up the edge. Again using the Indexing ring he aligned the piece up so the cutter was fixed half way between two of the original cuts and again with light touches started to cut the Spines on the back as seen in the photo.